From 2014 to 2018, we commemorate the centennial anniversaries of the First World War. The Vimy Foundation is actively working to ensure that these major battles of the First World War involving Canadians are recalled and our losses commemorated. Help us continue our work to highlight Canada’s lesser-known First World War battles, and commemorate these important centennial anniversaries. Please consider making a donation today. The City of Montreal has released a statement about the new Vimy Park. It will be built in two stages in spring of 2017, and the city will contribute $500,000 towards the refurbishment and construction of the park. Read the full details and statements here (in French). The Vimy Foundation is encouraged by the statement made by Mayor Coderre that a new Vimy Park will be established in the Notre-Dame-de-Grâce neighbourhood. As we approach the 100th Anniversary of this momentous event in April 2017, a moment Prime Minister Trudeau and many others have described as “the birth of our nation”, we are pleased to know that the City of Montreal will again have a Vimy Park to commemorate this important date in our history. We would have liked to have been part of a consultation on Vimy Park with the City of Montreal and Mayor Coderre, along with other relevant institutions as the local Legion branches and Regimental associations, both on the final selection of the park location as well as the future contents of the park, and would be happy to be so involved in coming weeks. It is essential that the new Vimy Park, honouring the legacy of the many thousands of Quebecois and other Canadians who fought in the First World War, is located where Montrealers and visitors can easily pay their respects and reflect upon the sacrifices of those who fought for our freedom. As the park will be a gathering place for years to come, it is important that its educational opportunities be accessible to all. Due diligence must be taken to ensure that the future Vimy Park be located in a space that is appropriate and does not replace another park with a historic name nor be reduced to a small corner of an existing park; Confederation Park within the NDG neighbourhood would not be an appropriate choice, especially given that next year will mark the 150th anniversary of this important event. After all, a great city like Montreal, as it marks its own 375th anniversary, should contribute to our nation’s collective memory and not its propensity for historical amnesia. On June 21, 2016, Montreal City Council voted to change the name of Vimy Park to Jacques Parizeau Park. 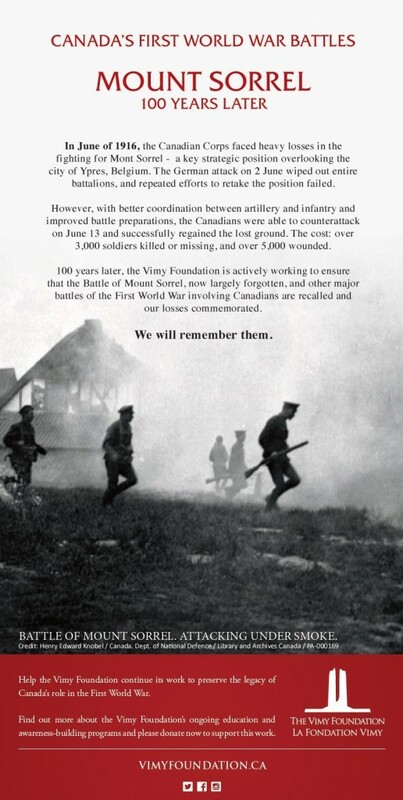 The Vimy Foundation is disappointed by this action taken by the City, and surprised that as we approach the 100th anniversary of the Battle of Vimy Ridge that Montreal would choose now of all times to erase the name of Vimy from the Park. A great historic city like Montreal should contribute to our nation’s collective memory and not its propensity for historical amnesia. Mayor Coderre, however, has committed to naming another Montreal park “Vimy” in time for the 100th anniversary of this important battle on April 9, 2017. The Vimy Foundation is encouraged by the support shown from the people of Montreal, city councillors, and other organizations for this new initiative, and we look forward to working with the City of Montreal and Mayor Coderre to ensure that the new Vimy Park, honouring the legacy of the many thousands of Quebecois and other Canadians who fought in the First World War, is located where Montrealers and visitors can easily pay their respects and reflect upon the sacrifices of those who fought for our freedom. The Vimy Foundation strongly urges the City of Montreal, and the district of Outremont, to reverse their decision to remove the name ‘Vimy’ from Vimy Park in Outremont. 60,000 Canadians from coast to coast to coast fought and died in the First World War. Vimy is widely considered as the defining moment in that war and in our nation’s collective history. Vimy remains our bloodiest day with nearly 4,000 killed and another 8,000 injured. As we approach the 100th Anniversary of this momentous event in April 2017, a moment Prime Minister Trudeau and many others have described as “the birth of our nation”, we are astonished that Montreal would choose now of all times to attempt to erase the name of Vimy from the Park! A great historic city like Montreal should contribute to our nation’s collective memory and not its propensity for historical amnesia. We do not dispute the importance of Mr Parizeau to Montreal, Quebec and even Canada, but surely the City can find another spot to honour his legacy (may we suggest St. Viateur Park, for one)? We note that this change of name coincides with the dropping of the name Claude-Jutra from another Montreal park. Is the name Vimy now also an embarrassment to be erased from Montreal’s past? April 2017 will mark the centennial anniversary of the Battle of Vimy Ridge. We will have a unique opportunity to remember the legacy of Vimy Ridge, to spread awareness of Canada’s coming-of-age on the global stage, and to celebrate our identity and pride to be Canadian. The Vimy Classroom Challenge invited teachers and students across Canada to participate in this legacy project – raising funds for the Foundation’s 2017 centennial activities and raising awareness in their schools and communities for this important anniversary. Over 15 school groups participated in this Challenge, and together raised over $15,000 for the upcoming centennial anniversaries. 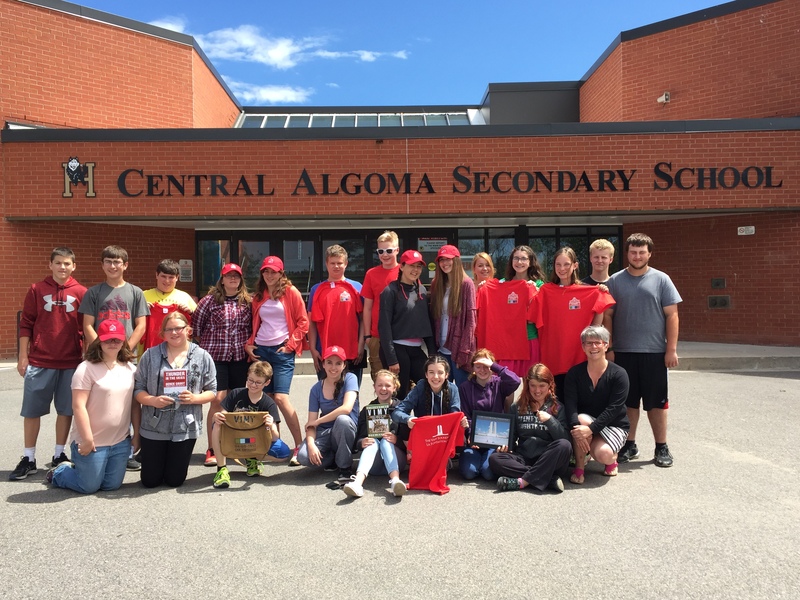 We are proud to announce that Central Algoma Secondary School is the winner of the Vimy Classroom Challenge Grand Prize! Six students and their teacher, Marla Adamson-Barber, will join the Vimy Foundation and EF Educational Tours Canada for the centennial celebrations in Vimy, France in April 2017. Travel is generously provided by EF Educational Tours Canada, a leader in providing life-changing travel experiences to students. The school is planning to continue fundraising in order that an additional 12 students from the school will be able join the trip. Vimy Ridge has remained a key part of our national understanding as a country because many of today’s core Canadian values were on display for the first time, collectively, at Vimy and were clearly a contributing factor to the battle’s success: leadership, teamwork and innovation. The Vimy Foundation is proud that students across Canada have exemplified these traits in the work that they do, demonstrated through their work in the Vimy Classroom Challenge, and in their commendable efforts to take up the torch of remembrance. Thank you to all the schools who participated.